A flighty fantasy about Shakespeare falling in love and getting a boost of inspiration to write Romeo And Juliet, Shakespeare In Love is a witty Elizabethan romantic comedy somewhat overburdened with riff raff. 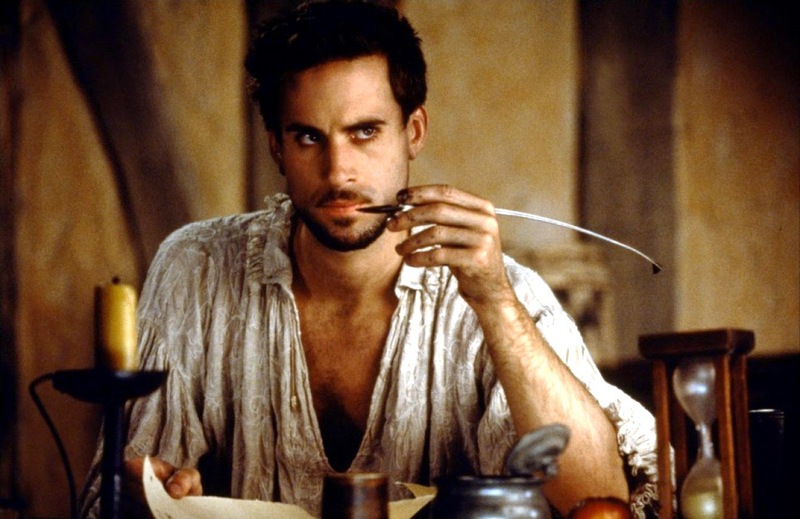 In sixteenth century London, celebrated playwright William Shakespeare (Joseph Fiennes) is suffering from writer's block while trying to finish a new comedy to be called Romeo and Ethel, the Pirate's Daughter. The wealthy Viola de Lesseps (Gwyneth Paltrow) admires Shakespeare's work and disguises herself as "Thomas Kent" to audition and win a role in the play. Shakespeare eventually discovers that Kent is Viola, and they start a passionate private affair, despite Viola being readied to marry the financially broke but nevertheless insufferable Lord Wessex (Colin Firth). His impossible love for Viola unleashes all of Shakespeare's emotions, and he writes the play at an amazing pace, transforming it from a comedy to the aching doomed romance of Romeo And Juliet. In public Viola maintains the persona of Thomas Kent as the play gets ready for the grand opening. But the lovers' secret is about to be revealed, and it will take the intervention of Queen Elizabeth (Judi Dench) to sort out the tangled web of romance, deception, and the outrage of a woman playing a woman's role on the London stage. Shakespeare In Love is saddled with plenty of peripheral characters contributing a cacophony of noise and colour. While they do add depth, they also add quite a volume of clutter, over-complicating a simple love story and creating no shortage of distractions. Philip Henslowe (Geoffrey Rush) is the struggling owner of The Rose theatre, Richard Burbage (Martin Clunes) is his rival and owner of The Curtain theatre, Ned Alleyn (Ben Affleck) is a smug actor, Hugh Fennyman (Tom Wilkinson) is a financier turned wannabe actor, and Christopher 'Kit' Marlowe (Rupert Everett) is the other celebrity London playwright. They all get prominent but ultimately inconsequential roles, and are joined by the Queen's officials, an army of theatre actors, and a healthy selection of upper society at the estate of Viola's parents, all milling in and out of every other scene, dressed in expansive costumes and sucking focus and energy away from the central story and bloating the film to over two hours. Director John Madden does much better when he zooms in on Shakespeare and Viola, and teases out a tender love story between the romantic playwright and the poetry-loving young woman from a well-to-do family. Joseph Fiennes and Gwyneth Paltrow find an immediate chemistry, and the temperature only rises as they start a steamy affair despite Viola's impending marriage to Lord Wessex. The script, by Marc Norman and Tom Stoppard, has fun with plenty of side references to many of Shakespeare's plays, but the core focus is on the power of deep love to unlock passionate inspiration, and this is where the film excels. Viola becomes Shakespeare's muse, in a celebration of romance unleashing genius. Fiennes is filled with the coiled energy of an artist on the cusp of brilliance, waiting for the spark to light his fire. Paltrow won the Best Actress Academy Award for combining rebellion against societal norms with a spirited intensity to pursue the love of a poet. Colin Firth and Ben Affleck deliver relatively cold supporting performances, Firth unable to break out of the confines of a small man demanding an obedient wife, while Affleck just stands around unconvincingly in an attempt to increase interest among American audiences. Madden successfully creates a bustling London of the 1500s, and does not shy away from external scenes. The streets are populated with throngs of residents going about their business, London an animated mess of normal people occupied by life. Only Queen Elizabeth's plundering presence disrupts the working class surroundings, Judi Dench winning the Best Supporting Actress Academy Award for a couple of scenes worth of ham. Shakespeare In Love won the Best Film Academy Award for 1998, surprisingly selected ahead of Saving Private Ryan. It remains one of the Academy's most embarrassing moments, a ridiculous victory for crass Award campaigning at the expense of true cinematic greatness. But while Shakespeare In Love may not have been the best film of its year, it is a classy and enjoyably witty romantic fable.